This is a collection of battery powered riding toys that range in user age from 3 years right up to tweens and teens. If you are looking for riding toys for toddlers from 18 months to 5 years of age GO HERE. Something for every taste here with a mix of cars, ATV’s, mini moto cross bikes and even sit down scooters. 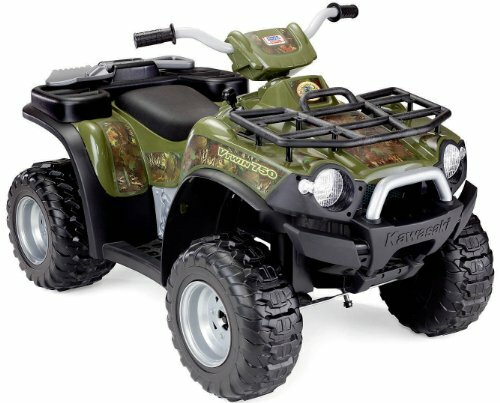 This realistic ATV from Fisher-Price is for kids 3 years and up and has a maximum weight of 130 pounds. It has a 12 volt battery and two forward speeds of 2.5 and 5 mph and also goes in reverse. All day adventure on this rugged vehicle that comes complete with camouflage decals and a heavy duty shovel on board. It has power lock brakes and treaded tires to perform on hard surfaces and grass. 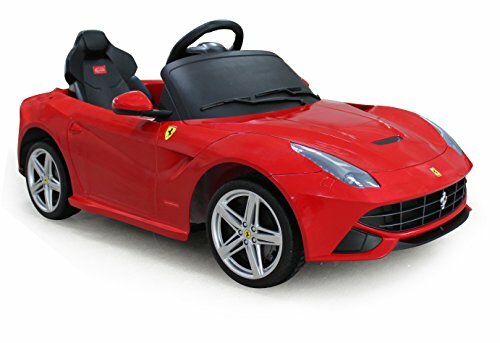 Everybody wants a Ferrari even kids. The suggested age for this beauty is 3-4 years. 12 volt rechargeable battery with a run time of up to 1.5 hours. This vehicle is fully loaded for kids with a key ignition that makes sounds, a pretend seatbelt and even an MP3 input jack. Releasing the foot pedal allows the car to stop quickly. This thing also has a wireless remote control if your kid doesn’t want to do the driving. Added realism of front lights and turn signal. The Monster Traction System allows this fun dune racer the ability to drive on hard surfaces, wet grass and rough terrain. Two forward speeds and reverse with metal sidebars for hand support. It has a roomy open cockpit design and is big enough for two kids cruising together. It has power lock breaks and a high speed lock for beginners until they get comfortable and confident driving. This three wheeler is a whole load of fun if you are older than eight and less than 120 pounds. Young daredevils and thrill seekers will have a blast with speeds up to 9 mph and a design that allows for full 360 degree spins, slides and drifts. It features a chain driven motor, with push button throttle and a hand operated brake system. Tons of fun here. 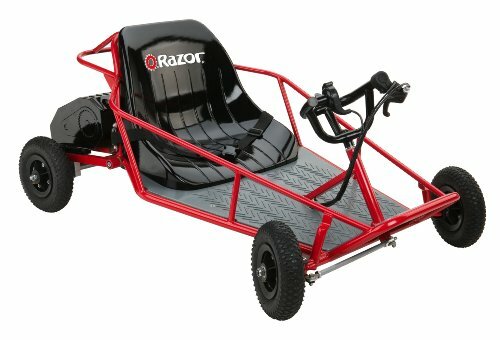 The Razor Dune Buggy is definitely for older kids. It has a powerful 350-watt electric motor and reaches speeds of up to 10 miles per hour. It can hold up to 120 pounds driver weight and is recommended for kids over 8 years. It doesn’t need any fuel to run and has a rechargeable battery. Fast enough for off road fun and safe at the same time with a durable tubular steel frame with diamond-plate floorboards, a padded seat and seat belt for added safety. 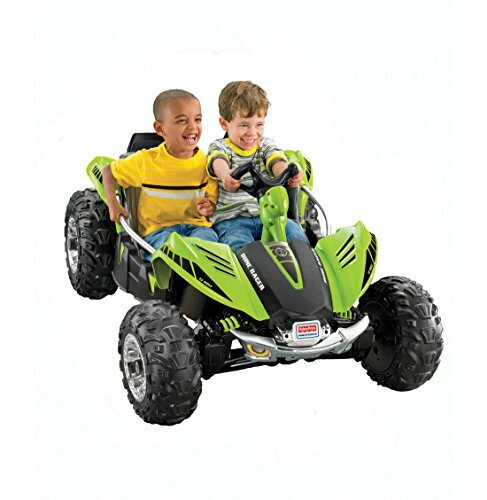 Hand operated throttle and rear disc brakes with 8″ pneumatic tires and rear suspension are also features of this battery operated electric dune buggy. 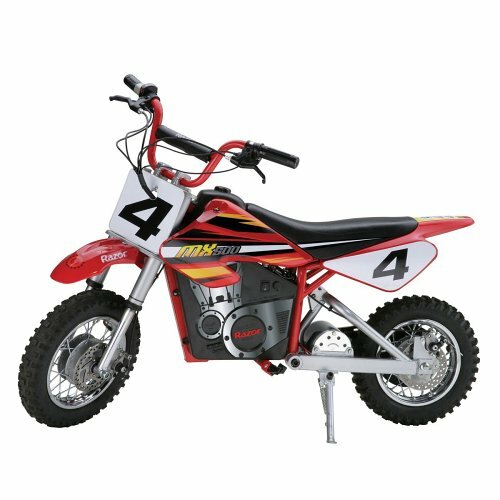 Don’t be afraid of the dirt with this high performance electric motocross bike for kids 14 and older. This is basically a scaled down motocross bike that can reach speeds of up to 17 miles per hour. It has the ability to cruise for up to 10 miles on a single battery charge. The maximum weight is 175 pounds and it comes with a 90 day warranty. This dirt bike from Razor has some great features like folding metal foot pegs, twist grip acceleration control and dual disc brakes operated by hand. It has steel construction and a variable speed and high torque chain driven motor. This is a safe and fun alternative to the gas powered motorbike. This is a scaled down version of a European type scooter that operates on a battery charged electric motor. 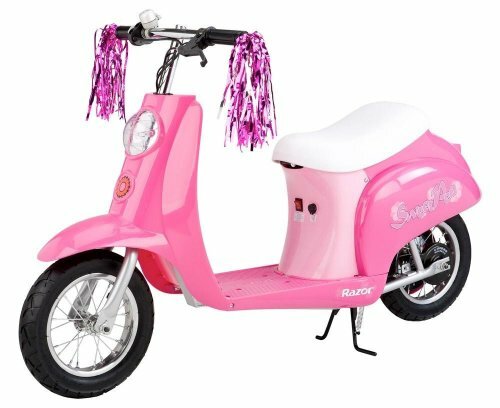 It is all dressed up in flashy metallic pink with handlebar streamers for added personality. This is recommended for riders 13 years and older and has a weight limit of 150 pounds. It has a handy storagI unit under the seat and can travel at speeds of up to 15 mph. It has a retractable metal kickstand and rides smooth with pneumatic tires and a single speed, chain driven motor. All the maneuverability of a scooter with the convenience of a seat for comfort. 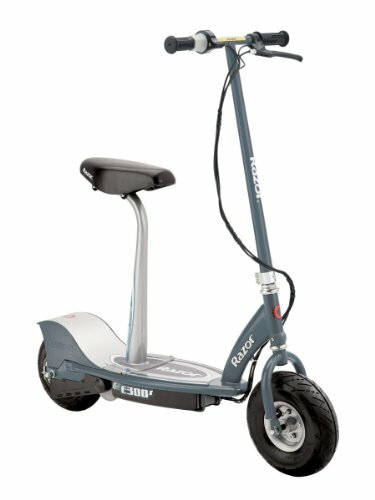 This ultra quiet scooter can go up to 15 miles an hour and can hold riders of almost any size. The seat is removable and can be used as a stand up as well. Well constructed and can hold a maximum driver weight of 220 pounds. Zip around the neighborhood on this quiet, smooth and uniquely designed battery powered scooter.